The present crisis demands new solutions. And the solution is public transport, for space to accommodate cars is limited and cleaner and fuel-efficient technologies defeated by the number of vehicles. The Delhi government is planning to have 120 km of metro, 292 km of brt, and 50 km each of monorail and light rail by 2020. These will be interconnected. We need different modes of transport. In the Walled City, for instance, metro or brt will not work because the roads are not wide enough. There we are going for the light rail system, says Rakesh Mehta, chief secretary, Delhi. brt is cheaper and quicker to construct as compared to metro. Metro costs Rs 100-300 crore per kilometre, while brt costs Rs 10-20 crore. While Bangalore metro is scheduled to roll out in 2011, I expect it to be ready only by 2015. Its intended coverage is inadequate, says G V Dasarathi, director of applications, Cadem Technologies, member of a network of citizens promoting public transport in Bangalore, Greener Bangalore. The Delhi metro has, however, inspired other cities. 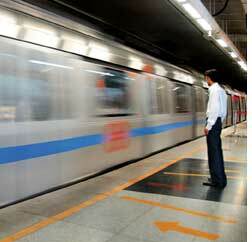 The Delhi Metro Rail Corporation (dmrc) has carried out a feasibility study for a Chennai metro. Ahmedabad and Hyderabad are also developing a metro system. But Kolkata and Delhi metros have not met the projected ridership. The Kolkata metro was to carry about 1.7 million passengers per day but its ridership is only 0.2-0.3 million. Integrating different public transport systems is crucial to their optimal utilization. We found that only people who live or work near metro stations and those who had cars and could park them were using the metro. We have 100 feeder buses and are going to get 300 more, says Anuj Dayal, public relations officer, dmrc. brt acting as a feeder to metro is a good thing. Metro cant reach everywhere and there is enough demand in Delhi for the two systems. Meeting this demand will require massive investment. But the benefits of public transport if properly countedhealth and energy and space efficiencywill make it worthwhile. Enhancing energy and emission efficiency will need a younger bus fleet and special provisions like a dedicated bus lane. One challenge with public transport is meeting its operational cost. Revenues come mainly from fares and advertisements, but fares have to be kept low to ensure that more people travel by bus. A few countries levy taxes on cars which are channelled into developing public transport. France asks employers with more than nine employees to pay a transport tax that contributes to public transport operation. Such a tax could be introduced in India, says S K Lohia, director, urban transport, urban development ministry. London levies a congestion tax on cars to drive into central London. It has now proposed linking the tax to emission levels. This discourages use of personal vehicles. Other possible sources of finance could be differential parking fees for private vehicles during peak and non-peak hours. Parking fares could also be varied depending on the locality and duration of space use. San Francisco, Belgrade and Bogota are some cities with such methods of parking pricing. Until recently public transport systems were not considered for the clean development mechanism (cdm). The brt system in Bogota, TransMilenio, is the only public transport system registered for cdm with the un Framework Convention on Climate Change. This makes it earn carbon credits. A new methodology for evaluating brt systems had to be developed when TransMilenio applied for cdm. Emission reductions are calculated taking into consideration upgrade of bus fleet, increased bus capacity, development of infrastructure for better bus operation and incentives for commuters to switch from cars to public transport. TransMilenios estimated revenue from cdm between 2006 and 2012 is us $ 20 million for reducing greenhouse gases by 1.7 million tonnes.